Cavanera encompasses the complexity of a unique land in its aromas, a land marked by the harsh conditions of winter high up in the mountains and the luxuriance of vines grown in full sunlight. Etna imparts strength and vigour to this rare and unique example of a blend of Carricante and Catarratto, telling the story of its age-old history and rebellious and generous nature. An intense wine flecked with golden glints, it brings to the nose hints of blossomed broom and aromatic herbs, which combine perfectly with the minerality of its essence. 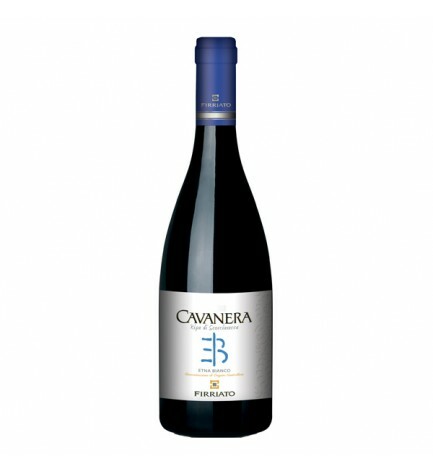 It unveils an elegant texture on the palate, with a perfect balance of acidity and softness. A great white wine from the mountains for wine lovers looking to discover an extreme and dynamic land. Colour: intense straw-yellow with green flecks. Nose: the enchanting intensity of its aromas clearly develops as it meets the nose with hints of yellow wild broom and acacia flowers, combined with fruity notes of white-fleshed fruit, apples and ripe peaches, not forgetting the nuances of aromatic herbs and seaweed. Gentle and unrelenting, it glows with elegance and body. Pure and aristocratic, it stands out amongst the great white wines produced in high-altitude vineyards. Palate: the charm of its minerality is unrivalled. Wonderful for its simplicity of style, distinguished by power and rotundity. The mouthfilling roundness of its imposing structure is a distinctive trait, making it the volcano’s archetypal wine. Characteristics: Lavish, elegant and austere. It is a hallmark wine embodying power and aristocratic smoothness. A perfect balance of acidity and freshness, with an endless wealth of minerality and saltiness. Special, unique and unrivalled. Etna’s process of evolution began about 600,000 years ago, from an encounter between the European-Asiatic land mass and the African land mass. Etna still bears witness to extraordinary encounters: the cold of the perennial snow and the intense heat of the lava flows, green woods and valleys of black lapilli, luxuriant mountains and the blue sea. In the same way, Cavanera Ripa di Scorciavacca is a modern-day testimony of an encounter between the Carricante and Catarratto grapes. Together they create a wine that is a natural and all-encompassing expression of a land that has no equals.